Until recently, I had never heard of carrot soufflé. And boy was I missing out! It was served at a rehearsal dinner we attended last month where the menu was made up of all the groom’s favorite foods. One of them? 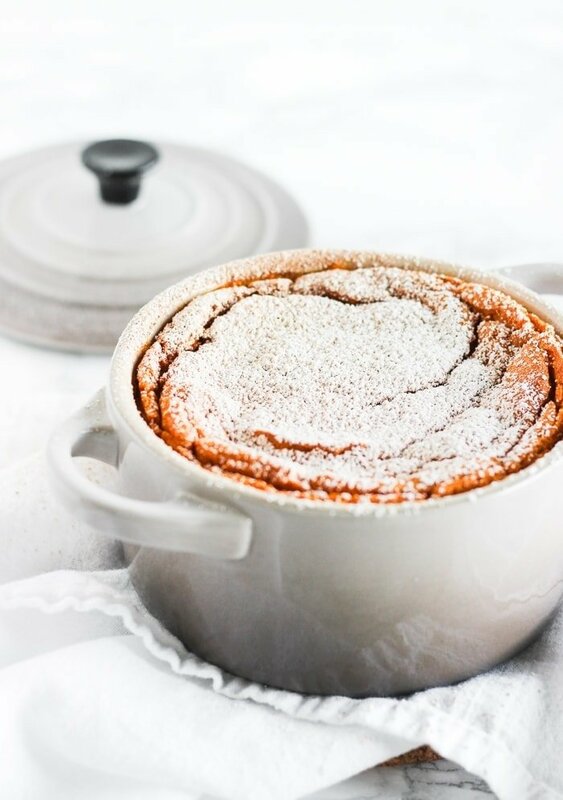 His mother’s carrot soufflé. It was delicious. 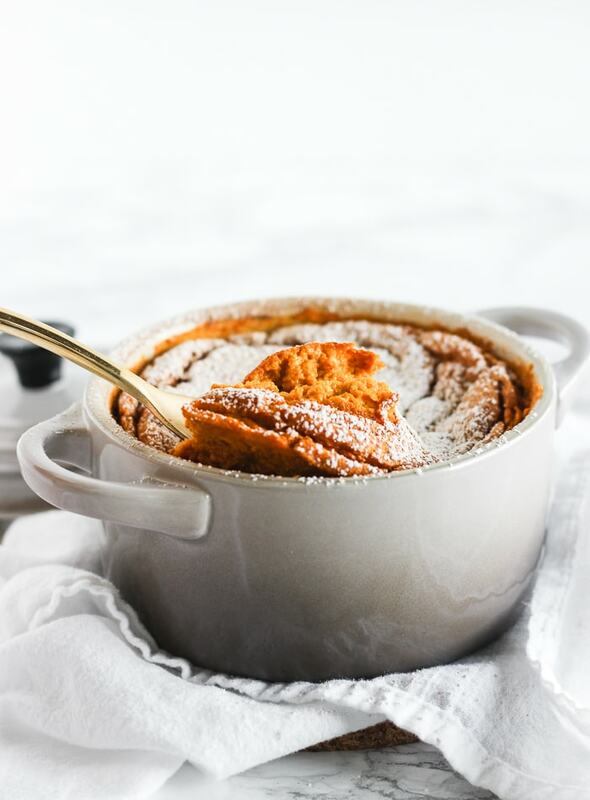 If you haven’t had carrot soufflé either, it’s not really a true soufflé, with all of the holding your breath hoping it doesn’t deflate, but more of a pureed carrot casserole that’s kind of puffy. Similar to sweet potato casserole but lighter. 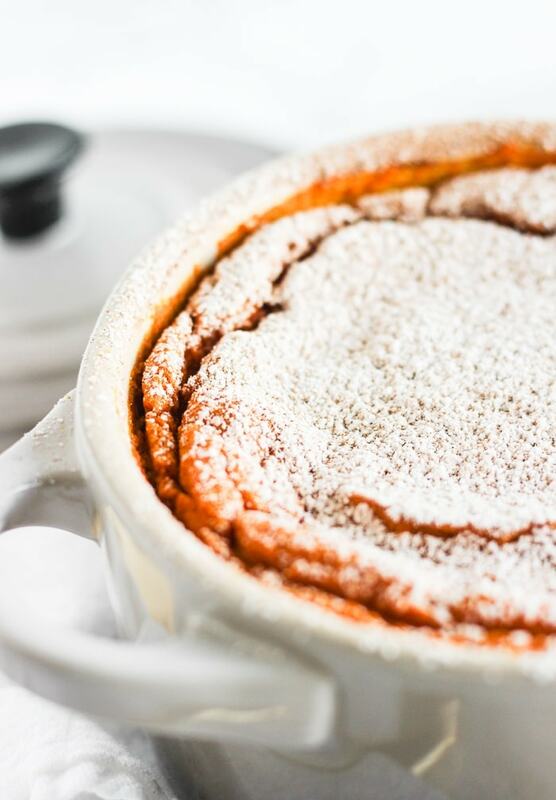 When we got home, I knew I had to try making this carrot soufflé. It would be the perfect Easter side dish. With a little research, I found that there are both sweet and savory versions, and that neither are too difficult to make. And the sweet version, true to Southern fare, was loaded with butter and sugar. So I set out to make a lighter carrot soufflé that still tasted as delicious as the original. 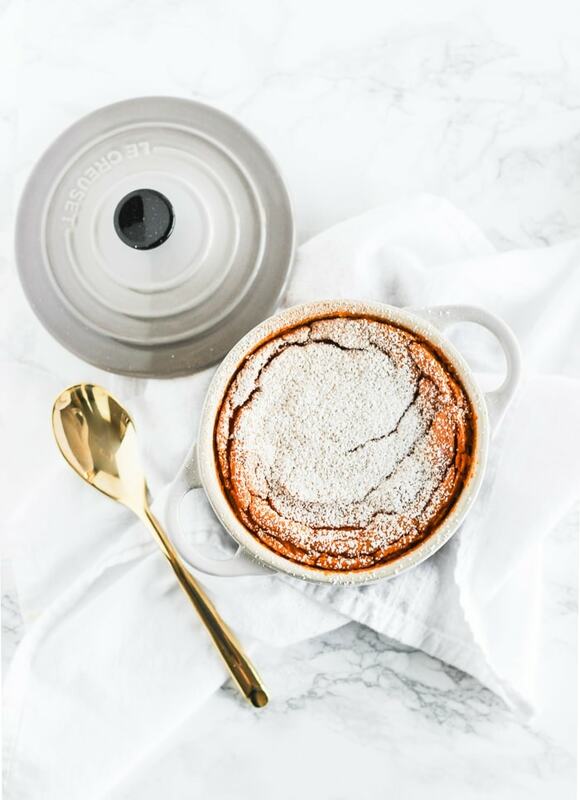 The result is this gorgeous cinnamon and ginger carrot soufflé. It’s light and airy, with plenty of spice and just enough sweetness. I used whipped egg whites to up the fluff factor and reduced the sugar and butter, replacing some of the butter with Greek yogurt (always my secret weapon) to keep the same creamy texture. And I was quite impressed with myself! 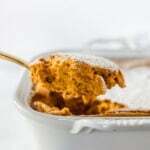 This carrot soufflé is a must-have side dish for all of you holiday celebrations. It goes just as beautifully with an Easter ham as it does with a Thanksgiving turkey. Your guests will love it, and never know that it’s just a bit healthier. Heat oven to 350°F. Lightly grease a 2-quart baking dish. Place carrots in a large saucepan and fill with enough water to cover carrots completely. Bring to a boil and simmer 15 minutes, or until tender. Drain. Meanwhile, in a stand mixer or in a large bowl with a hand mixer, beat egg whites and cream of tartar until stiff peaks form. Add carrots to a blender or food processor. Blend until smooth. Add remaining ingredients except for egg whites. Blend until smooth. Gently spoon mixture into bowl with egg whites and fold in until completely incorporated. Gently spoon mixture into prepared baking dish. Bake at 350°F for 40 minutes or until puffed and set. Remove from oven and dust lightly with powdered sugar and cinnamon. Use fresh egg whites for the best results. Pasteurized carton egg whites will not stiffen as well. This recipe can be halved or doubled as needed. Yum! I’m making it! Can it be made a day ahead and reheated to serve? I haven’t tried making it ahead, but I’m sure it’s just as delicious reheated!